My Beauty Regimen turns 1 year! It's been a year since my last visit to this facial center. All I got from this facial care center was pain. Yes, pain from all that pricking and squeezing especially in the nose area. I don't know but many people are paying hundreds even thousands of pesos to get their faces squeezed and pricked to gain beauty. Beauty has a price and its painful in the face and in the pocket. I decided to stop my bi-weekly visits with the pseudo-dermas and looked for alternative ways to keep my face clean. It's getting costly, I'm getting tired of being a high-maintenance person plus the facial services are getting costly. My face is always oily. I thought after shedding more than 70 pounds of fat in 3 years will make my face clear of all this facial oil. It did not. Having an oily face adds up weight, makes you fat and makes your face bloated. But having an oily face means you will have more years of having younger looking skin. Having too much oil in the face means more chance for dirt to stick to your face and clog your pores. Remember last year? I got addicted to this Grapefruit and Tea Tree Toner from Avon? Yup, I still have it. As a matter of fact, I am hoarding this product from my Avon Lady at work. 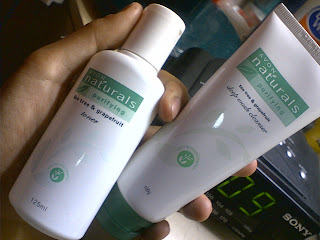 I'm still using it, only now I use it with Avon Naturals' Purifying Tea Tree and Grapefruit Deep Wash Cleanser. It is the best product for my face especially when clearing your face with dirt and oil. I love the smell too, it's like grapefruit juice, feels like putting Vitamin C to your face. Now that's cleaning without the pricking! After using the product, since I use it twice a day (before work and before sleeping), I apply moisturizer. I have two favorite moisturizers/creams: OLAY Total Effects (before sleep) and Ponds Detox Vitamin Cream (before work). OLAY Total Effects is by far the best moisturizer I had (second is this Irish Seaweed from Body Shop). It made my face moisturized after cleansing, plus it helped in keeping my face look less stressed! Ponds Detox Creams is my fave especially in removing spots from my previous zits and keeping my face look less oily for hours. Speaking of zits, I still have few especially near my ears. Its probably caused by few of my oral supplements. Of course, I also use Nivea for my skin and lips. My face is oily but the rest of my skin is dry especially after bathing. 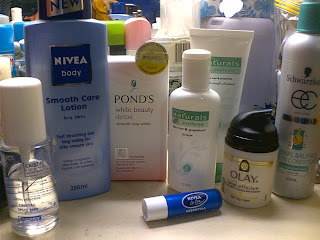 I have Nivea Body for Dry Skin and Nivea Lip Care Essential. Before I use the Strawberry but it made my lips so red, it looked like wearing a lipstick. The Essential Lip Care variety is better especially if you have dry lips. I also discovered this product at David's Salon called Cristal Serum. I always apply it on my hair to keep it moisturized and lessen the bad effects of putting wax and clay for styling. On weekends I also use Schwarzkopf Hair Repair Leave In Conditioner. 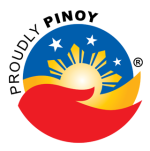 I haven't seen the exact variant I have here in the Philippines. My aunts from Aussie sent me this product. I love it when I want to let my hair down.